Camping with kids doesn't always go as planned. Important gear is forgotten, messes are made and some things just get a bit trickier when little ones are involved. 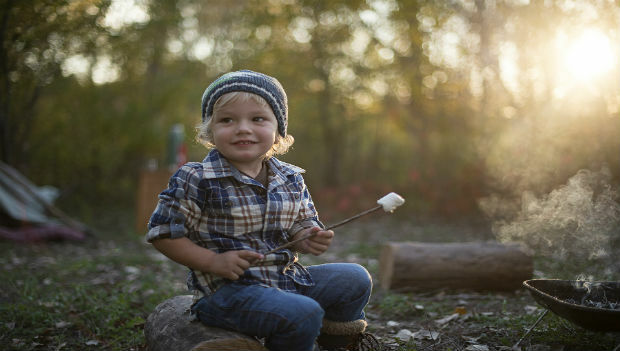 But don't fear; we've put together this guide to steer parents through many common–and messy, awkward or just plain gross–situations in the great outdoors. If you're camping with an infant or a young child who isn't potty trained, how do you dispose of diapers? While traditional campgrounds usually have dumpsters on-site, the solution is more involved if you're camping at a primitive campground or in the backcountry. Specifically, like all of your other trash, diapers will have to be packed out with you. First, place dirty diapers in a plastic zipper bag, then drop a dryer sheet inside. This system helps minimize the stink until you can toss those diapers in the trash, but note that scented dryer sheets should not be used in bear country. The outdoors doesn't come with indoor plumbing, so there will come a time when your kids will need to pee or poop in the woods. First, find a secluded location where they can have some privacy (perhaps behind a big rock or a tree). Make sure the spot is at least 200 feet away from any water source, and if the child has to poop, dig a hole four inches wide and six inches deep. Then, let the kid do their business. Remember that toilet paper (single-ply and fragrance free for camping) will need to be packed out, so use the same technique recommended for diapers. Finally, depending on your daughter's age, female urination devices can make it easier for girls to pee in the outdoors. Vomit happens, and if you're camping with kids, sometimes it happens all over the place. Packing a sponge and an all-natural, biodegradable liquid soap like Campsuds or Dr. Bronner's will allow you to clean up any unexpected messes. First, dilute the soap in water, then scrub until clean. Remember to pack one or two extra sets of clothes for the little ones because accidents can--and do--occur frequently. To keep the public showering experience as pleasant as possible, make sure to pack shower shoes for you and your kids. You can also speed up the showering process by using all-natural soap to wash both hair and body. Finally, make the process of dressing afterwards easier by changing into shorts. Because of their length, long pants inevitably become wet with shower-floor water when kids are getting dressed, so slip into shorts first and then, if the weather calls for it, put on pants back in your tent. And if you just can't face a public shower stall, or if you're camping in a place without amenities, portable shower devices like the Nemo Helio are great.